“Bateaux” were rowboats propelled by oars, sometimes called skiffs. They were built for speed. They were keel less, smooth, flat-bottomed boats with ends tapering to points. In 1766, at Pittsburgh, Bateaux’ were built for Baynton, Wharton, Morgan & Co. (Baynton, John, Wharton, Samuel, and Morgan, George) of Philadelphia for their use in supplying their Ohio River trading posts. In 1766, George Morgan established a post at Beech Bottom, Virginia. In 1786, Congress established the first mail route over the Allegheny Mountains to run from Alexandria, Virginia to Pittsburgh, Pennsylvania, and shortly thereafter, Post Riders were bringing the mail to Wheeling. On June 7, 1794, Col. John Finley was appointed the first Postmaster at Wheeling, Virginia, where he established Wheeling’s first Post Office in the old Fort Randolph U.S. Troop Garrison, and there he served as Wheeling’s first Postmaster. 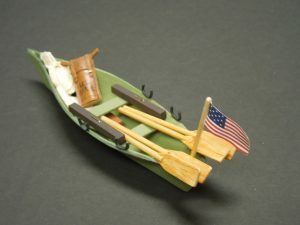 Mail was brought to Wheeling by Post Riders from Pittsburgh, sorted and relayed in rowboats, “Bateaux’s” on to Marietta, Cincinnati and Limestone, Kentucky. The Mail service to Limestone, (Maysville) Kentucky was set-up by Major Isaac Craig, who was experienced in river navigation and Colonel James O’Hara, the army contractor, in charge of arrangements. Major Craig had Wheeling’s James Palmer and James Patton boat yards build three Bateaux for this endeavor. Each “Bateaux” was 22 feet long and the wood was treated with a wood preservative, Paris green, Arsenic, thus the green colour. On July 5, 1794, Elijah Martin was appointed boat master of Mail Boat No. 1 and Charles Mills was appointed master of Mail Boat No. 2 on July 12, 1794. Each boat crew consisted of two rowers and a well-armed captain. They stowed their muskets in a weatherproof box alongside their seats. These boats could make sixty miles a day down-stream and thirty up-stream. From Wheeling, the first boat carried mail to Marietta, a second boat took the mail to Gallipolis and the third delivered the mail to Limestone, Kentucky. Each boat made one round trip weekly. This service was discontinued in 1797 when “Zanes Trace” opened and post riders then carried the mail over Zane’s path. Mail was carried in leather U.S. Mail Pouches. Wheeling’s Bloch Brothers Tobacco Company dates from 1879, when Samuel and Aaron Bloch started their business with ten women hand rolling cigars. Left overs (the sweepings) of this process was flavored with licorice, packaged and sold as chewing tobacco in a paper pouch. 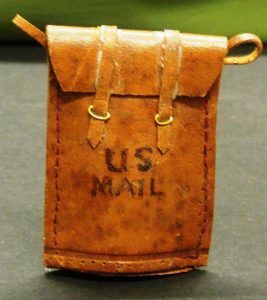 They had a contest to name their new product and chose the name suggested by a Wheeling Postman, ‘Mail Pouch Chewing Tobacco’.